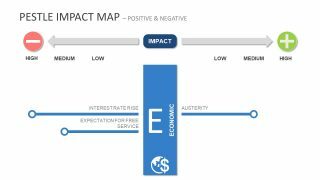 The PESTEL Impact Map PowerPoint Templates presents a colorful visual of business marketing model. 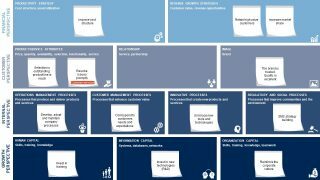 PESTEL(Political Economic Social Technological Environmental Legal) is a framework for business analysis and monitoring of external marketing environment. 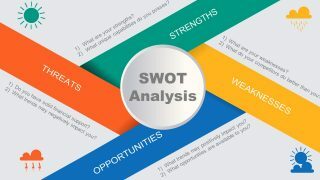 The outcome of PESTEL analysis is often used as input to threat and weaknesses in SWOT analysis. 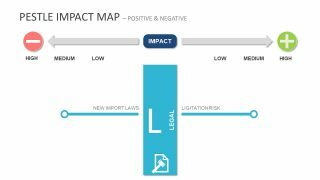 However, this PowerPoint impact map demonstrates negative-positive affects of certain tasks and their implementation on PESTEL. The template basically provides a colorful illustration of comparison table with 6 segments. 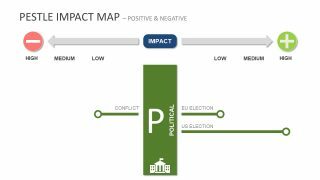 And, PESTEL impact map design shows plus and minus symbols with “impact” in between to display negative and positive influence. 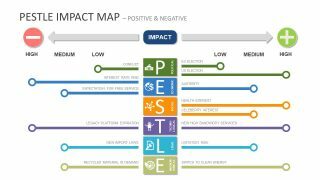 The PESTEL Impact Map PowerPoint Templates is ideal for supporting an idea or strategic plan. 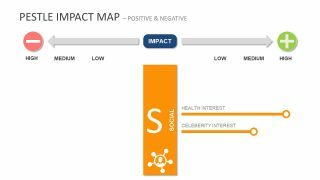 The will assist professionals to communicate their concerns in a visually comprehensive way. Because graphics stay longer in memory. 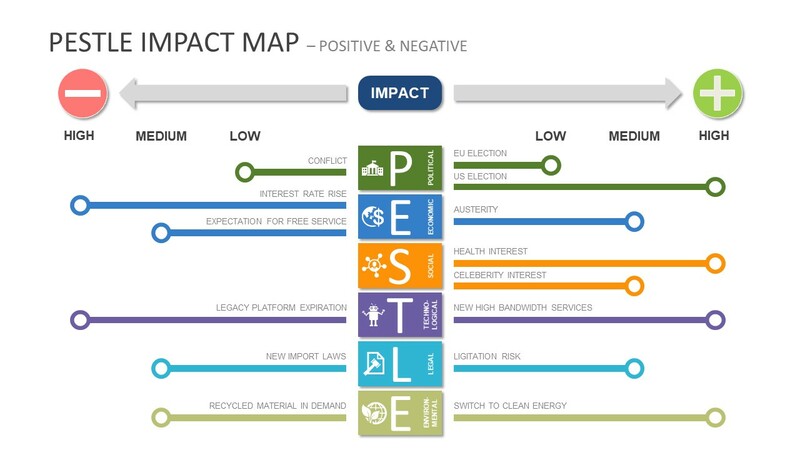 Therefore, the PESTEL impact map PowerPoint contain infographic icons for each component of PESTEL analysis. These infographics include parliament building, global & currency, user network, robot, legal hammer symbol, and globe with leaves. 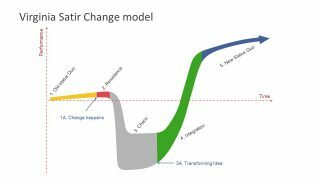 The PESTEL PowerPoint model further includes left and right arrows. 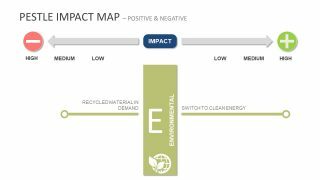 These arrows display the intensity of impact i.e. low, medium, or high. 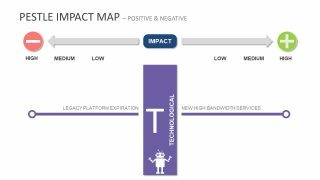 The PESTEL analysis PowerPoint template with an impact map contains 7 slides. After the overview template, additional 6 slides highlight all components of PESTEL individually. 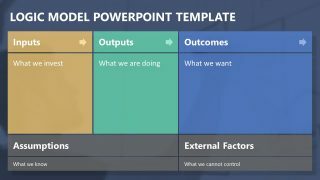 For convenience, the PowerPoint template provides some pre-defined factors which may have a positive or negative impact on project analysis. Download this PESTEL presentation template instead of traditional circular diagram. Simply, change colors, text, and visual effects of template according to presentation needs.